Jaroslav Janus again sat backup to Branislav Konrad in Bratislava's 4-2 Game Three loss to Dynamo Moscow. Ex-Lightning prospect Michal Sersen had a helper in defeat for Slovan while ex-Lightning draft pick Marek Kvapil had a goal for victorious Dynamo. Bratislava will try to stave off elimination in Game Four on Monday. Vasily Koshechkin continued his strong playoff run stopping 21 shots in Game Three for a critical 3-2 Cherepovets win over Yaroslavl. The winning goal for Severstal was scored by former Lightning first rounder Nikita Alexeev. Ex-Lightning draft pick Denis Kazionov had 4 shots in 17:40 for Cherepovets. Game Four is Monday. Cedrick "The Entertainer" Desjardins stopped all 29 shots he faced for his second consecutive shutout. Nothing wrong with that. Desjardins, Tyler Johnson (pictured), and Ondrej Palat were the game's three stars. Johnson currently sits 1 point behind Grover Nyquist of Grand Rapids for the top spot in the league in scoring and Brett Connolly is 4 back of Nyqvist in a tie for 5th in the league. Johnson also leads the league in goals and Palat is tied for 2nd in the league in assists, 2 back of leader Jeff Taffe of Hershey. After scoring just 2 points in the entire month of January, Mark Barberio has 11 so far in February. With Springfield getting thumped by Worcester today, Syracuse extends their Eastern Conference lead to 5 points over the Falcons and Senators with the Falcons hold 2 games in hand. Syracuse will go for 8 straight on Tuesday against Rochester. Not even 24 hours after notching his first shutout in a Syracuse Crunch sweater, Cedrick Desjardins was back at it. 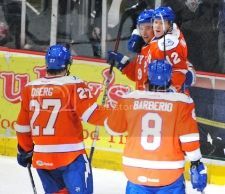 The netminder kept his streak going, stopping all 29 shots and leading the Crunch to a 4-0 win over the Connecticut Whale at the Onondaga County War Memorial Sunday afternoon. "You never expect that," Desjardins said of his back-to-back whitewashes. "Those were two big games for us and teams we don't see a lot. We need to step up against those teams." Gotovets remains out of the Cornell lineup. No word as to why. The Crimson were outshot 31-20, but won where it counted, 6-2. Lightning prospect Brian Hart had two assists for Harvard. Miami completed their weekend sweep of LSSU and is now two points away from clinching the CCHA regular season championship. Brendan O’Donnell was back in the UND lineup in a fourth line role, helping his school to a 6-1 win over Denver in Colorado. Friday Correction: O’Donnell was indeed in the North Dakota lineup on Friday night. Our report said he was a healthy scratch. After a big game Friday against rival Yale on national television, the Bobcats suffered a bit of a letdown, blowing a 3-1 lead and tying sub .500 Brown. Brown’s last two goals were scored with less than three minutes remaining in regulation. Matt Peca was on the ice for both goals. The Gophers gave up two one-goal leads to the unranked Bulldogs, tying their in-state rivals 2-2 on Saturday. Undrafted freshman Matt McNeely was the story for UMD, stopping 38 of 40 shots in net. A two-game series settled nothing as the Irish and Broncos tied for the second consecutive night. This time the Irish won the shootout, though the game is officially a tie. Luke Witkowski (pictured, Eric DuBose photo) had two assists in the series.